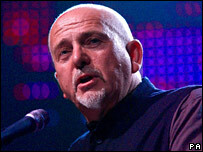 Musician Peter Gabriel is to perform at this summer's Womad festival to mark its 25th anniversary. Gabriel, the co-founder of the world music event, will appear on 27 July with a line-up which includes 70 artists from 40 countries. The event will be held at Charlton Park in Wiltshire for the first time, after 17 years at Rivermead in Berkshire. Organisers chose to move the festival from its former site in Reading because it was becoming too crowded. Gabriel said: "It has been wonderful to see what has happened with Womad over the last 25 years. It is different from any other festival I've even been to. "Although I usually get to enjoy it from the audience rather than the stage, I'm delighted to come back for this 25th anniversary," added the performer. Gabriel originally inspired the idea for a world music festival in 1980, leading to the first edition in 1982. Since 1988, other Womad festivals have taken place at different locations around the world. Former Genesis star Gabriel endorsed the decision to move the principal site to Wiltshire, saying "it just felt that there was beginning to be a negative noise about Reading". Despite switching venues, there are no plans to increase the 20,000 capacity of the event, which will take place between 27-29 July.